Fatal drowning is one of the most frequent causes of accidental death for kids under the age of 14. Because of this, you need to create and enforce measures to ensure safety around your pool. Awareness is a key part of decreasing drownings. Risk levels change as your children grow up, but it’s always important to have some provisions in place. 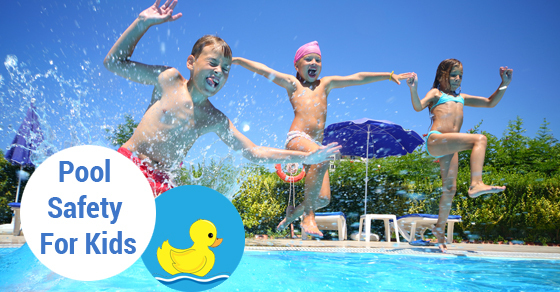 Make sure you can always see your young children when they are swimming, as this is the only way you can help them. The younger the kid, the more unpredictable, they can be–so always keep your eyes out. Keep your toddler close enough that you could get them if anything goes wrong. Once your child can understand more, create rules and make sure they follow them even if they are at a friend’s place. This should include requiring your child to ask an adult for permission to go in the pool. You can also get your kids to educate their friends who may not have the same rules. If you have teenagers who are apt to engage in risky behaviours, make sure they know to never swim alone. Also talks to your teenager about how drugs and alcohol can affect swimming and educate them on why they shouldn’t dive into shallow water. Buying pool covers is essential, but keep in mind you should also always supervise your kids. Pool fences and safety covers are the most popular items used for protecting kids. You should buy one that is compliant with ASTM standards, which started in 1898 and is now a huge organization for developing standards and classifications. Keep in mind that they do not approve specific products’ compliance with their standards, so if a company claims their products are compliant you should double check on the ASTM website. You should check often whether the cover you buy is installed properly and the gate is locked as it should be. Look out for signs of wear, too. Getting your kids enrolled in swimming lessons when they are old enough will help them feel comfortable and stay safe early on. Lessons will also make them less fascinated with your pool since they’ll spend plenty of time in one and learn how they should act in the water. You should also take a CPR class, so if an accident does happen, you’ll be ready to act quickly.